As an after-hours GP, I am often called to treat severe cases of childhood eczema. In some of the children I’ve seen, large areas of their skin have been affected, making daily life tough during flare-ups. These children can become too unwell to attend school and are unable to play sports or run around like normal kids should. I have seen children with eczema that has become infected and the child needed to be hospitalized for intravenous antibiotics. Debilitating, uncomfortable eczema can be very painful. It is, of course, distressing for the child, but often also for the parents who are grappling with identifying and managing the condition. No one wants to see their child uncomfortable or in pain – but here is the good news, as parents, you can arm yourself with knowledge about the condition and what can be done to relieve symptoms in order to help remove some of your child’s discomfort. Eczema is the term for a number of conditions that make the skin inflamed, red and itchy. Young children generally have more sensitive sk­­­­­in than adults, and they’re at a higher risk of developing the condition. A study from the University of Melbourne shows one in three Australian infants suffer from eczema. If we look at the United States, one in eight children suffer from eczema; in Ireland, it’s one in five. What types of eczema exist? Most people associate eczema with itchy, red patches on the skin, but many don’t know that there are eight different types. 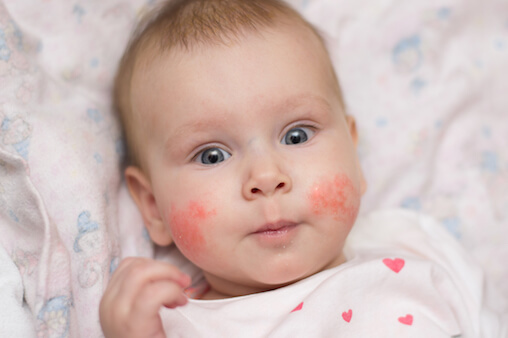 Eczema usually appears within the first six months to five years of a child’s life. It typically develops on the face but can appear anywhere on the body. What does childhood eczema look like? Eczema can appear in different ways and in different places on a child’s body across various stages of their life. 0-6 months: appears on face, cheeks, forehead and scalp. The skin tends to look more red and weepy. 6 – 12 months: appears on elbows and knees as they are easily scratched or rubbed during crawling. 2 – 5 years: likely to appear in creases of elbows, knees, wrists, hands, and ankles. It may also appear around the mouth and eyelids. The skin may look dry, scaly and thick. 5+ years: Usually appears in the folds of elbows and/or knees. It can also appear on the hands, behind the ears, feet or scalp. What are the common triggers of eczema? While the cause is still largely unknown, genetics and environmental triggers can play a large role in the development of eczema. It is not contagious. Saliva – can irritate baby’s cheeks, chin and neck. Weather – dry air in winter may worsen symptoms. How can childhood eczema be treated? Eczema generally isn’t cured, but is managed – that’s a fact that parents often struggle to come to terms with. Children with severe eczema require on-going management and treatment of acute flare ups. In the beginning this can be quite overwhelming for parents or carers who often express this to me during consultations. Thankfully though, there are many treatment options that can help manage symptoms. These include over-the-counter medications, prescription medications, and topical creams or ointments. Each child is different, and their eczema may be triggered by a range of things. Keep a log of flare ups and try to eliminate exposure to any of the triggers you can identify. Moisturising after bathing can help protect the skin and lock in moisture and oils, which may help soothe affected areas or reduce flare ups. Medication (such as topical corticosteroids) may be suggested by your doctor. They are typically applied twice daily to affected areas. Only use as prescribed by your doctor, as they vary in strength and can damage the skin if they are used incorrectly. In some cases, antihistamines and oral or topical antibiotics may also be prescribed. How can childhood eczema be prevented? A lot of children’s eczema improves and sometimes goes away completely as they become older and enter adulthood. In fact, it’s estimated only 10 per cent of children with eczema or atopic dermatitis will continue to suffer as adults. The uncertainty of how childhood eczema will affect your son or daughter’s future can be a difficult aspect of the illness for parents. As a doctor I cannot predict when or if a child’s eczema will disappear, but I can help parents and children manage the condition for the best possible outcome. 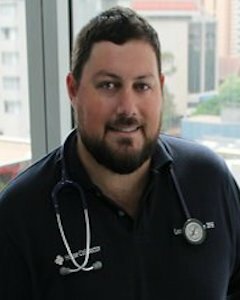 Dr Ryan Harvey is a General Practitioner providing after-hours medical care to children and families. He currently practices at House Call Doctor, an organization that provides urgent after-hours medical care to residents in Queensland and New South Wales, Australia when their regular GP is closed.